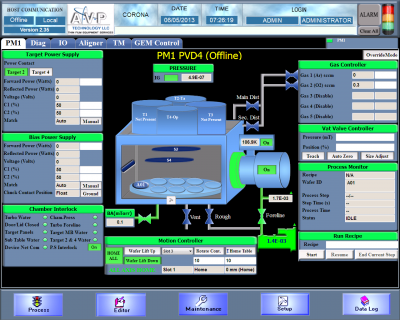 AVP’s automation software is designed from the ground up to provide maximum flexibility ease of operation for the end user. Our universal automation software platform is semi standard, including touch screen and GEM/SECS compatibility. The GUI is extremely user friendly and quickly adapted by new users with or without experience. AVP utilizes easily recognized semi standard color coding within the GUI which greatly reduces the learning curve and provides instant recognition to alarm situations. Utilizing a single automation infrastructure for our complete line of process equipment, our automation software improves engineering productivity throughout the entire equipment life time. This includes equipment design, install, operations and support, with the final goal of driving down the total cost of ownership for our customers. Switching from one toolset to the next running on our software platform is usually accomplished within a few hours. AVP has over a hundred tools running our automation software 24/7 in production FABs worldwide for many years now. 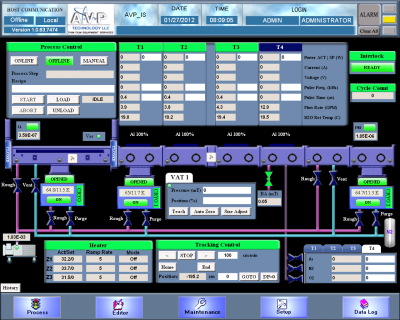 AVP’s automation software has been proven itself to be one of the most reliable, comprehensive and easy to operate software platforms for our customers. 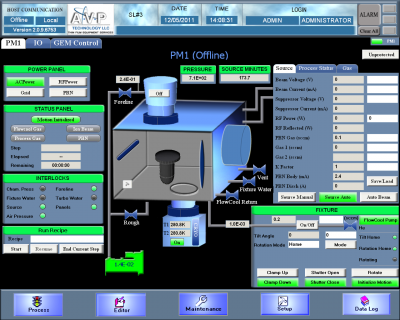 Unified GUI and Control System for all AVP Products: PVD, HR PVD, Multi-target PVD, IBE, RIE, In-line PVD/Etching. Based on Windows XP/7 and GEM/SECS compatible. Designed on plug & play concept and additional components can be upgraded in the field; thus minimizing system downtime. Vastly improved software response time (100ms update time). User friendly GUI-SEMI E95 standard colors and graphics and touch screen compatible. Commitment for long term timely support and upgrades. Ethernet (LAN) connection between FEC & PM computers and custom configuration settings definitions available. Recipe management with superior & simplified process creating screen. Built in process parameter graphing display capability, and data export function. 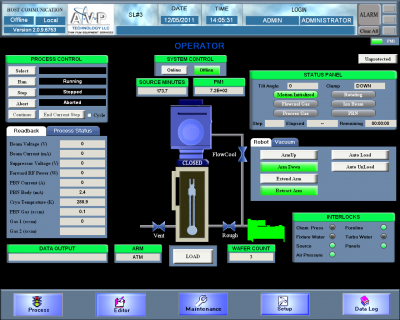 Complete and custom Data logging and Alarm handling and Simplified wafer scheduling screen.